Outdoor fireplace kit from Stone Age Manufacturing, Inc. If you use your patio frequently for entertaining or cooking out, consider building an outdoor fireplace to help enhance the space. Outdoor fireplace kits give you everything you need to build the fireplace of your dreams, whether the style you are after is a modern fireplace grill or Olde English wall. 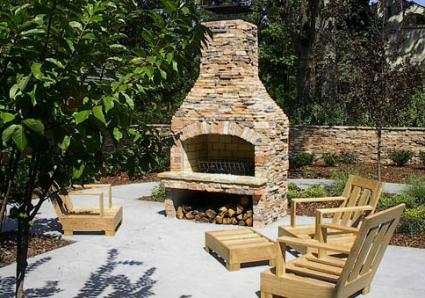 There are two basic types of outdoor fireplace kits. Both come in a range of different styles, but their construction method is what sets them apart from one another. The bricks or blocks are pre-sized and cut to the exact specifications of your fireplace; there is no need to rent a saw or to chisel away at the product. Firebricks and blocks come labeled with their use and placement; just stack or place them according to the diagram. All pieces are included for a final look, including stone or wood mantels, mortar, bricks, blocks and hearth. These kits feature a low cost; a kit often costs a fraction of the cost of a build-from-scratch masonry fireplace and chimney. 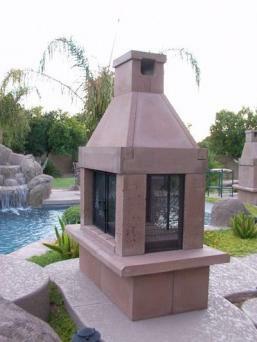 FireRock masonry fireplaces are made of a concrete masonry box with two to three feet of chimney. Veneer packages allow you to customize the final product with the look of brick or stone. Vantage Hearth makes a mosaic style outdoor fireplace kit that gives you different options for both the color and the placement of the bricks inside the firebox, as well as numerous options for the hearth, mantel and surround. Cambridge Pavers makes Olde English Wall style fireplaces with dry-stacked stone. They give you the option of having a gas insert for your fireplace, along with the standard wood-burning options. Stone Age fireplaces have several different masonry options available, including brick oven and stone wall. Their kits range from rustic and simplistic to ornate and detailed. Semplice is a large, freestanding outdoor fireplace made of beautiful firebrick. It's available in three colors to give you a range of looks. Rockwood Contemporary Fireplace uses a propane or gas insert built into the center of the streamlined masonry design. The elevated firebox makes viewing a pleasure when seated nearby. Easy assembly: The fireplaces are made up of fewer pieces than masonry models. Modern style: If a rustic fireplace won't fit in with your patio's style, the more modern and streamlined looks of the modular fireplaces might. No Portland Cement: Because the pieces lock together, there is no need for mortar. Lightweight: Without all the bricks, blocks and stones of the other models, modular units are typically lighter while still maintaining their durability. Moveable: Modular fireplaces do not have to stay in one spot, so you can move them around your yard or take them with you when you move. Forno Bravo makes a modular outdoor fireplace kit that is lightweight and durable with the interior lined with true firebricks. Mantels Direct Perfect Outdoor Fireplace is a lightweight modular unit that is open on four sides for a 360 degree view. 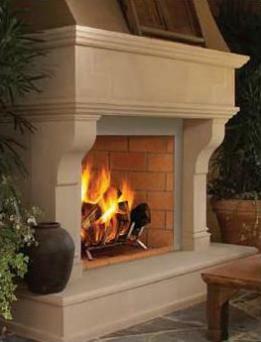 Stonewood modular fireplace kits come in straight, curved and arched styles. Once the kit is put together, cover it in stone veneer to get the look of a masonry fireplace without the work or mortar. 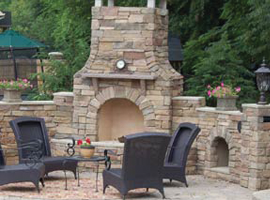 The outdoor fireplace is often the centerpiece of the patio or outdoor living room. Use a kit to build your fireplace and you may be pleasantly surprised at just how easily it goes up.